Aug. 26, 2017 10:57 a.m.
Never before has pink hair struck such fear into the hearts of young batters. Abbotsford’s Raine Padgham became the first player to ever play on a girls and boys team at the Western Canadian Baseball Championships last weekend, and her dominance of both genders has been turning heads. Standing only five feet tall and weighing a little over 100 pounds, Padgham strikes out boys much bigger and stronger than her and can hold her own in the batter’s box and out in the field. Often times, the last thing a batter sees is her signature flow of pink hair after she tricks them with one of her signature pitches. Padgham has been rocking the pink hair since the age of six, and explained why she was motivated to colour her brown locks. Both boys and girls became well aware of Padgham’s prowess on the mound at the WCBCs, which ran in Kamloops from Aug. 17 to 20. The 12-year-old Grade 7 Abbotsford Middle School student played on the B.C. Selects girls team and then was scooped up by the host Kamloops Riverdogs pee wee boys team for the tournament. It marked the first time in the history of the event that a girl had ever participated against boys. But the moment didn’t seem to intimidate Padgham. She helped lead the B.C. Selects to a championship, clinching the title by pitching a no-hitter against Alberta on Sunday. She was dominant in her appearances for the boys team, but the two teams had to manage her pitch count between them, limiting her time on the mound against the boys. It’s not just the mound where she excelled, as Padgham contributed with several hits and solid fielding while playing against the boys. Kamloops head coach Tim Foster said she was a valuable part of the boys team, which finished fourth at the event. Baseball has been a part of Padgham’s life since she can remember. She began participating in the sport at the age of three. It’s a family affair, as her father played single A baseball professionally in the United States and her older brother Chance Padgham is also a well-regarded player in the Aldergrove Minor Baseball system. She said she picked up the sport relatively quickly. “I kind of knew I was pretty good after about a year when my parents would get complaints from other parents that I was throwing the ball too hard,” she said with a grin. Her father said they worked on the basics of the game with Raine early, and she has kept up the hard work. 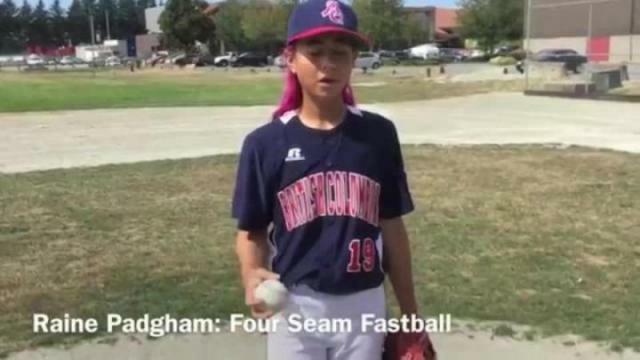 As a pitcher, Padgham has a knuckleball, a fastball, change-up and a submarine sidearm pitch that transforms into a very-difficult-to-hit curveball. She can already throw in the mid-60 miles per hour range, and if she continues developing at her current pace, she could eventually reach speeds of 80 mph or higher. Playing against boys is nothing new for Padgham; she has been doing it her whole life, but admits she does get a little bit of joy from sending boys back to the dugout. The recent story of Claire Eccles, the first woman to pitch in the men’s West Coast League with the Victoria Harbourcats, helped inspire Padgham, and the two baseball stars are well aware of each other. Padgham said her ultimate goal is to represent Team Canada – on both the boys and girls teams at the Olympics and other international events. Allan said he wants her to compete against boys as long as she can, and for her to follow her dreams in the sport. For more information on Padgham and her baseball journey, visit her website at rainepadgham.weebly.com.